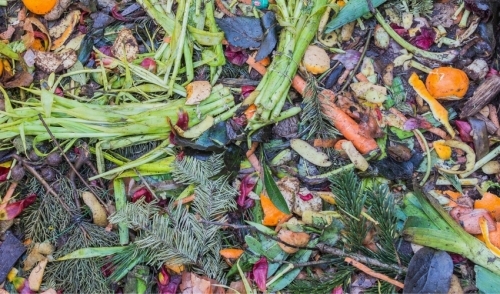 Composting may slow as temperatures drop, but it doesn't need to stop even in freezing weather. By understanding your winter compost options and how to keep your compost active and thriving through the coldest months, you can have a fantastic supply of nutrient-rich compost ready and waiting for spring planting. Creating a simple windbreak around three sides of the pile, leaving one side open for access to add to the pile all winter. Piling hay bales or bags of raked leaves around the compost to serve as insulation. Leaves are a handy option that can also be layered into the pile throughout the winter. Lay a thick tarp over the pile to keep off excess snow and rain while keeping heat in the pile. A dark colored tarp will absorb more heat from the sun. Move your compost pile, bin, or tumbler to a sunny spot for the winter so it can take advantage of what solar heat is available. Moving a tumbler or bin compost system into the garage for the winter, which will also keep the compost warmer and more active. Use a kitchen compost bucket to collect scraps before making one outdoor trip to add material to the pile, resulting in fewer trips into the cold to tend the pile. Use a tarp to cover the pile, but position one corner of the tarp in such a way that it will be easy to lift for adding material over the winter. If your compost pile is not feasible to operate in the winter, you need other options for composting scraps and keeping the process going until spring. Fortunately, there are ways to compost even if it is impossible to do outside in the winter. Investigate vermicomposting, a using worms to accelerate the process, and create a small vermicomposting bin in the house or garage for winter use. Chop kitchen scraps into smaller pieces before adding them to a compost bin or pile. Smaller scraps decompose faster, saving space in small winter bins. Work with neighbors to combine compost to create a larger pile that can be self-sustaining in winter, then divide the compost for everyone to use in spring. While it may be more challenging to create compost in the winter, there are many winter compost options that can keep this type of organic recycling alive and well even during deep freezes, giving you a healthy, rich supply of compost ready for spring planting. © 2019 Shoal Creek Nursery LLC. All rights reserved.